ATLANTA — A potentially life-saving kidney transplant has given a Georgia family a lot to be grateful for this Thanksgiving, nearly two months after the operation was controversially delayed. A.J. Burgess, who will be 3 in January, was born without kidneys. 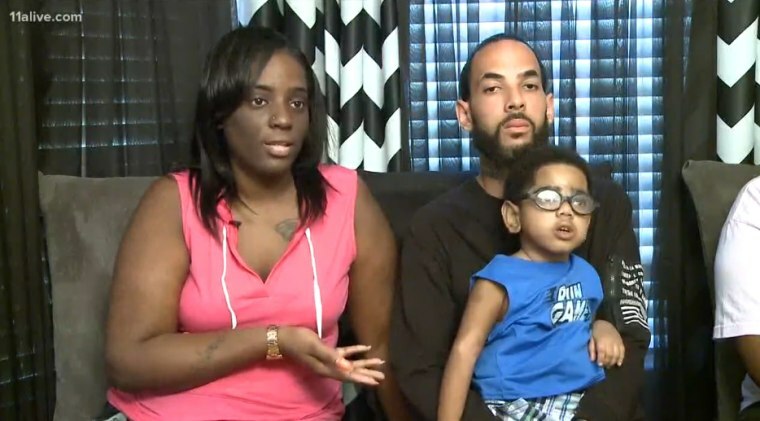 His parents got word at around 8 p.m. Tuesday that a kidney from a dead donor was available, and the toddler had a successful transplant Wednesday morning, said Mawuli Davis, a lawyer for A.J. 's parents. The boy will have to stay in the hospital for about a week, including the Thanksgiving holiday on Thursday, but his parents are "excited about giving thanks for his new kidney," Davis said in a phone interview. The transplant comes after a setback last month when Emory University Hospital told the family it was delaying a transplant of a kidney from A.J. 's father, Anthony Dickerson, who was a perfect match. Dickerson has repeatedly been in trouble with the law and was arrested again in September. That didn't initially seem to be an obstacle. A letter to the Gwinnett County jail from Emory's Kidney and Pancreas Transplant Program requested his temporary release. "If Mr. Dickerson could be escorted to Emory for blood work and a pre-operative appointment tomorrow, September 29, we will be able to continue with the scheduled surgery," the Sept. 28 letter says. But then A.J. 's mother, Carmellia Burgess, received a letter from the hospital saying the surgery would be delayed until Dickerson could provide documentation from his parole officer showing compliance for the next three months. "We will re-evaluate Mr. Dickerson in January 2018 after receipt of this completed documentation," the letter said. Burgess told news outlets her child's life was being unfairly endangered because of his father's mistakes. The story resonated with people around the country and the local community rallied around the family, demanding justice for A.J. Emory Healthcare officials and physicians met with A.J. 's parents, their lawyers and community supporters on Nov. 2. A statement from Emory said the meeting was meant to open the lines of communication and to have an open and honest discussion about how best to help A.J. "In reviewing our communication with the family, Emory Healthcare wants to acknowledge and apologize for a breakdown in communication on our part," the statement said. Emory and the family continued to communicate, and A.J. remained on a list for a donated kidney even as his father went through the process to be able to donate his kidney, Davis said. When a kidney became available Tuesday, the doctors decided it was in the boy's best interest to go ahead with the dead donor's kidney, he said. The transplant doctors said the surgery Wednesday went very well and that A.J. was in recovery and would be moved to the intensive care unit, Davis said.